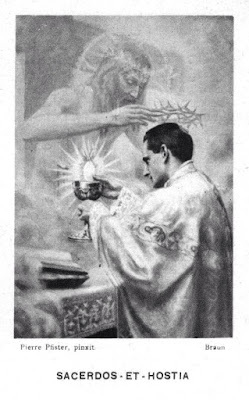 Even if the Liturgical Office could be separated from the Mass, we should still be able to say that it unites those who take part in it to the intentions of Christ and His Church; but the two cannot be separated. The Divine Office is the prelude and preparation as well as the setting and sequence of the Eucharistic Mysteries. Archeologists have traced the many relationships between the Divine Office and the Mass. 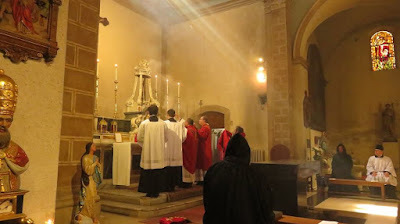 For example, the office of Matins presents a striking analogy with the night or morning service held in the primitive Church as a preparation for the Mysteriesi a reminiscence of which is still to be found in the early part of Holy Mass as we know it. The Psalms of the Nocturns correspond to the Introit and Gradual; while in the Lessons from the Old Testament or from the Epistles, in the second nocturn giving the legends of the Saints, in the Homily on the Gospel, there are relics of the Prophecies, the Apostolic Messages to the Churches, the Acts of the Martyrs and the parts of the Gospel, which were read in those early celebrations. 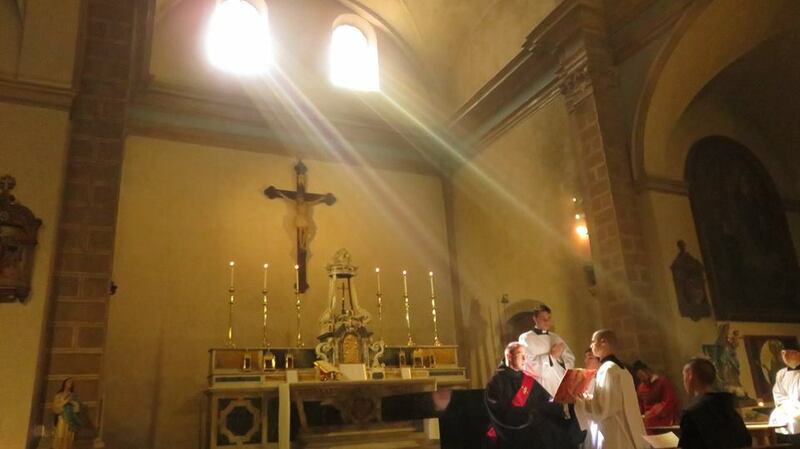 Then, the Catechumens were dismissed, and this Missa was followed by the Holy Sacrifice. According to some scholars, the Te Deum may be nothing else but an ancient kind of IZZatio or Preface. This close dependence of the Breviary on the first part of Mass is at least a very plausible theory. Thus, from its connection with the Divine Mysteries and because it is the official prayer of the Church, the Divine Office leads to union with the purposes of God and with the intentions of Christ and His Church. How Many Times a Year Must a Priest Say Mass? 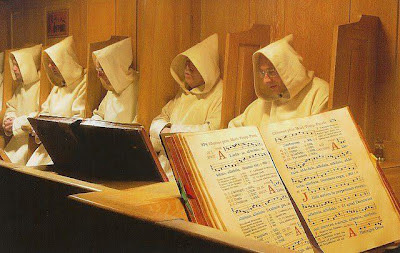 (2) To establish a community in view of (1) in which common religious life is lived in a more disciplined and traditional way including the celebration of the liturgy according to the usus antiquior of the Roman Rite, with the liturgical books of 1962 being normative. The Missionaries of St. John the Baptist desire to be faithful to the observance of the liturgical traditions according to the dispositions of the motu proprio, Ecclesia Dei Adflicta, issued on July 2, 1988, as well as the motu proprio, Summorum Pontificum (cf. art. 3), issued on July 7, 2007, and promulgated on September 14, 2007. The shield is for battle in the Lord’s army and is blue for Our Lady of Victories. The Sacred and Immaculate Hearts at the center show how the whole world needs to have them for its focus. All the arrows of the cross point inward to them! Without them man is lost! Thus, as they have asked of us, we must give them everything in a total consecration and spend our lives in dedication to them... as the very center of counter-revolution! 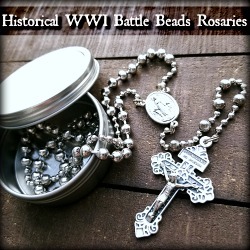 The shell is for baptism when we first received the armor of God as members of the Church Militant on earth. It also stresses the importance of St. John the Baptist as the forerunner of Christ. Three drops of water for the Most Holy Trinity as well as the three vows of poverty, chastity and obedience (which act as a second baptism for religious), and the virtues of faith, hope and charity (given at baptism). The fleur-de-lys is for Our Lady and for France, the country of our founder, Fr. 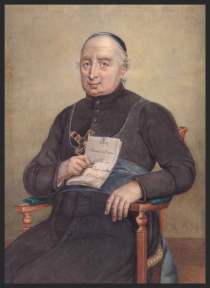 Jean Baptiste Rauzan (d. 1847), as well as the purity of heart needed for religious and sound preaching. 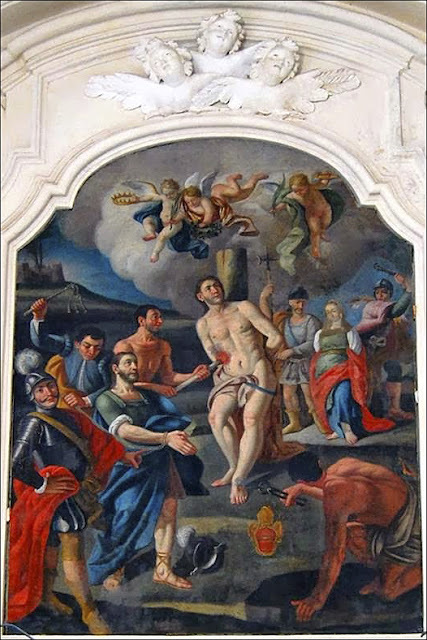 The Cross is that of St. John the Baptist, being red for his martyrdom. The motto of the Missionaries is that of St. John the Baptist: “A voice of one crying in the desert, prepare ye the way of the Lord” (Matt. 3:3). 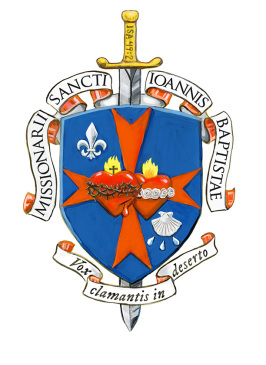 This private association of the faithful, officially recognized as the Missionaries of Saint John the Baptist (MSJB), stems from the spiritual legacy of the Congregation of the Priests of Mercy, which was originally founded at Lyon, France, in 1808, by the Very Reverend, Jean Baptiste Rauzan, a zealous priest of Bordeaux. Fr. Rauzan noted that after the great upheaval which the Church suffered in France during the Revolution, the clergy and people sought from heaven extraordinary ways to foster the salvation of souls. Many ways were employed to revitalize the faith. A congregation of missionaries was desired which would be at the call of their excellencies, the bishops. 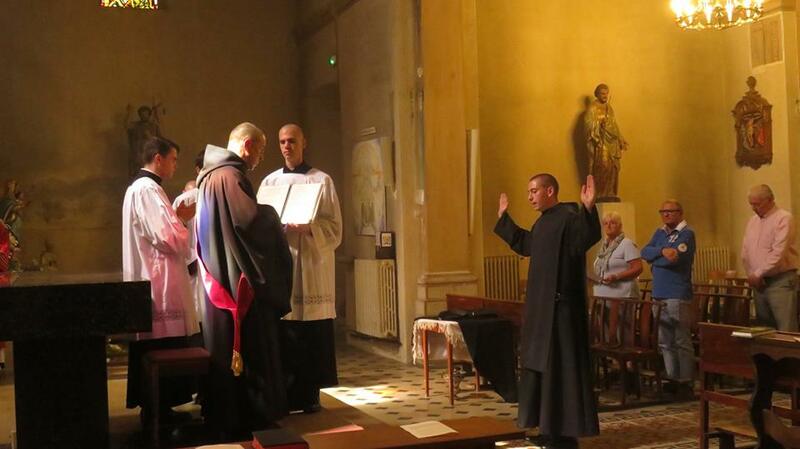 Consequently, Archbishop Joseph Cardianal Fesch, requested that Fr. Rauzan found such a missionary society first at Lyons under the Empire in 1808, and organized at Paris during the first days of the Restoration in 1814. These first Missionaries of France received, without difficulty, the privileges of a legally constituted society. 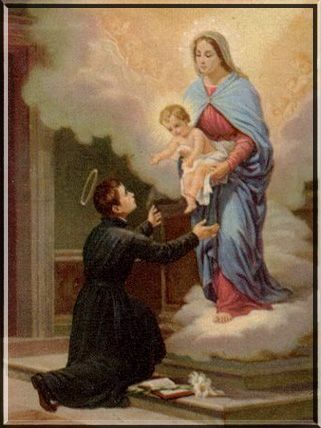 On February 18, 1834, Pope Gregory XVI, of holy memory, established and erected this little band of missionaries as a pontifical society under the title of the Priests of Mercy of the Immaculate Conception of the Blessed Virgin Mary. By 1961, the Holy See fulfilled the long held desire of Fr. Rauzan by further elevating the institute to a full religious congregation with the members adding the public vow of poverty to that of chastity and obedience. 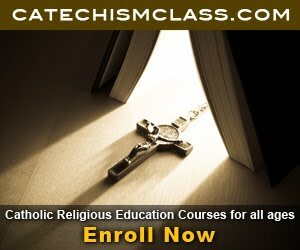 In the aftermath of the Second Vatican Council, mitigations in religious discipline and liturgical revisions were observed in many institutes that caused some religious to seek restoration. 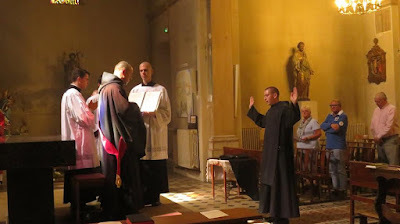 Two members of the Congregation of the Priests of Mercy, inspired by various papal documents and exhortations calling for reform, sought permission to establish a new institute that would not only embrace a more rigorous consecrated life, but would also employ all the Sacraments according to their usus antiquior. The superior and the council of the congregation, as well as the Bishop of Covington, Kentucky, Roger J. Foys, agreed to this new foundation. The Missionaries of Saint John the Baptist seek to maintain the spiritual and liturgical patrimony left to them by Fr. Jean Baptiste Rauzan, including making use of much of his original rule. The same revolutionary errors he confronted and corrected are now fully entrenched in the modern world. Like the great Precursor of our Lord, therefore, we, too, are a voice crying in the wilderness, preparing the way of the Lord and making straight His paths (Isaias 40:30), so that all things may be restored in Christ the King. Such counter-revolutionary work within ourselves, within our community, within the membership of Holy Church, and within society in general, however, is tempered by modern man's need for the Mercy of God. Since our dearest Lord came not to condemn the world but to save the world (John 12:47), we look to imitate the methods of the greatest of Prophets and Fr. Rauzan who were sent to turn the heart of the fathers to their children and the heart of the children to their fathers: lest (God) come and strike the earth with anathema (Malachias 4:6). The Lord Jesus commands that we foster vocations, "Ask the master of the harvest to send out labourers for his harvest" (Mt 9:38). Praying for priestly vocations is not optional. 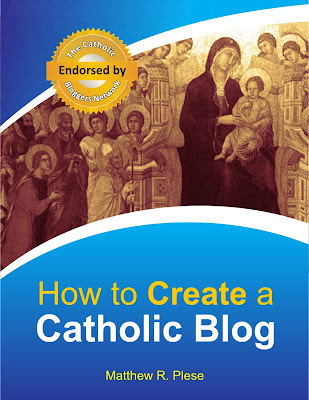 This might be a revelation for many a good Catholic. Praying for priestly vocations is not a matter of spiritual taste or preference. Rather, praying for priestly vocations manifests our shared responsibility in obtaining from God the many "other Christs" - the priests needed chiefly for offering the Holy Sacrifice of the Mass and for reconciling penitents, but also for evangelizing, for instructing converts, and for performing the countless works of education, culture, and charity granted by God to the world through His holy priesthood. Sin has three consequences: Guilt, Debt, and Stain of Sin. Confession can remove the guilt; the sinner or anyone on behalf of the sinner can "pay" the debt, but only the sinner can remove the stain of sin by by amending their life and correcting their spiritual malfunctions. To say of the recently departed that "they dead are no longer suffering" belies a profound lack of charity for those souls. The souls in Purgatory suffer incredibly for even the smallest transgression; we ought to offer indulgences and Masses for the Poor Souls. + My Son, in the Introit of today’s Mass our holy mother the Church sings: “It behooves us to glory in the Cross of our Lord Jesus Christ: in whom is our salvation, life, and resurrection: by whom we are saved and delivered.” There are many words written and spoken about the monastic life, but few are more apt, more poignant, than these words given us by the Church’s Sacred Liturgy today. For a monk is a man who, in dying to himself and to the ways of the world, truly embraces the Cross of our Lord Jesus Christ, and who finds in that embrace salvation, life and resurrection. One year ago today, on this blessed feast of the Exaltation of the Holy Cross you were clothed in the habit of a novice. And now, today, after a year of testing, a year of bearing patiently with the limitations and exigencies of our small monastic foundation—and yet, also, a year of fidelity to the life of prayer and work which is to be found in any monastery, great or small, that is worthy of the name—you come vow yourself to this life for three years. You are doing a foolish thing. There are so many other things you could be doing. 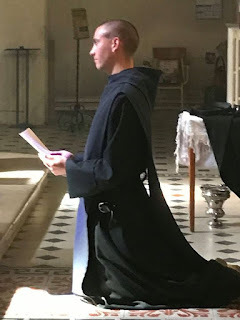 And yet, as has become clear throughout your time of testing, you can do no other thing than this today, for it is to this monastic obedience that Almighty God calls you. The Gradual of today’s Mass mediates on the reality that “Christ became obedient for us unto death: even the death of the cross. Wherefore God also hath exalted Him, and hath given a Name which is above every name.” Once again the words of the Sacred Liturgy sing most eloquently of the monastic vocation: obedience unto death is the path to exaltation in heavenly glory! Our Lord himself suffered terribly. Your monastic life will certainly know times of difficulty and may even, as the twenty-first century unfolds, bring you suffering and persecution the likes of which we hope have been consigned to history. My Son, no matter how dark the shadows of the Cross that fall upon you may be, know that they are always cast by the light of Easter morning. Hold fast to our Lord’s teaching that “He who perseveres to the end will be saved” (Matthew 24:13). In the holy perseverance that is your vocation you are not alone. As the formula of your vows makes clear, you will live your monastic life in a monastery, with the fraternal love of your brethren. You will live it in the communion of the whole Church, in union with our Bishop and with the local Church of Fréjus-Toulon. You will call upon the saints—particularly those saints whose relics are kept here—to assist you. And you have the support of family and friends who are here with us today, of the good people of this beautiful village of La Garde-Freinet who are so kind and generous to us, and of many others besides who have sent pledges of Masses and prayers being offered for your intentions today. Today the Church blesses you and solemnly prays for your faithful perseverance in the vows you are about to make. But today is not about you, my son. Today is about God: it is an eloquent testimony to what Almighty God can do with and for each and every one of us—whatever our particular vocation may be—if only we are prepared to deny ourselves, take up the burden of the Cross and follow Christ without reserve: to Calvary, certainly, but with the even greater certainty of unending life beyond. The Holy Father also said in 1970: "In many areas the Council has not so far given us peace but rather stirred up troubles and problems that in no way serve to strengthen the Kingdom of God within the Church or within its souls." This radically contradicts the Church's infallible teaching that the Holy Spirit works only through the Catholic Church, outside of which there exists no salvation (extra ecclesiam nulla salus). Pope Pius IX in his Syllabus of Errors condemned the Protestant notion that "Man may, in the observance of any religion whatever, find the way of eternal salvation, and arrive at eternal salvation." Hence, we see Vatican II conniving with the French Revolution of 1789, which was Masonically generated to instigate rebellion against the Faith, just as the Council connived with Luther's Reformation which was generated for this same purpose. But as with the Reformation, the Vatican II revolution was waged under the pretext of a reform so that people would see it as "magisterial." What we are witnessing today is the Magisterium vs. the counter-magisterium, which is precisely what Pope John Paul II while a cardinal was trying to alert us to in his prophetic warning about the rise of an "anti-Church" that would preach an "anti-Gospel." During his visit to America in 1976, Cardinal Karol Wojtyla delivered this prophetic message in Philadelphia, on the occasion of the bicentennial anniversary of American Independence. "We are now standing in the face of the greatest historical confrontation humanity has gone through. I do not think that wide circles of American society or wide circles of the Christian community realize this fully. We are now facing the final confrontation between the Church and the anti-Church, of the Gospel versus the anti-Gospel. We must be prepared to undergo great trials in the not-too-distant future; trials that will require us to be ready to give up even our lives.... How many times has the renewal of the Church been brought about in blood! It will not be different this time." A true renewal would mean restoring the Church to its former position of honor as it stood before Vatican II. Such efforts will inevitably bring great persecution and even "blood" upon those who push for this, so great is the modern-day addiction to the conciliar idol of change. Reviving the cause of Luther in fact was a key objective of the Second Vatican Council, as affirmed by Fr. Edward Schillebeeckx, a prominent figure of the Council who said: "The accusation of connivance with the Reformation is therefore not without foundation." Conniving with the Reformation is something the post-conciliar church officially recognizes, as we read in the 1980 Joint Catholic-Lutheran Commission which grew out of Vatican II: "Among the ideas of the Second Vatican Council, we can see gathered together much of what Luther asked for, such as the following: description of the Church as ‘The People of God’ (a democratic and non-hierarchical idea); accent on the priesthood of all baptized; the right of the individual to freedom of religion." Unfortunately, this connivance has now reached the point that the Vatican on October 31 issued a postage stamp on which Martin Luther is depicted kneeling with St. John before Jesus. Shall the Vatican also issue a stamp with Hitler kneeling before Jesus? The point being that Luther was a heretic and notorious enemy of God, who taught that Jesus was an adulterer, who rejected six books of the Bible, who dubbed the Sacrifice of the Mass "sacrilegious and abominable," and who utterly cursed the papacy. Should Rome be commemorating Luther and praising him as "a witness to the Gospel?" It was for reason that Luther was excommunicated in 1521, whereupon the Council of Trent later condemned his Reformation, decreeing that those who hold to its errors are an anathema. How is it then that Rome is now praising a heretic who the Church officially holds to be an enemy of the Christian Faith? 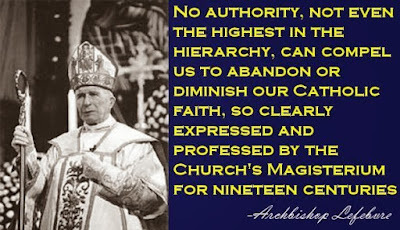 The answer: Vatican II had a key role in infecting the Church with this heresy. There were six known Protestant delegates at the Second Vatican Council who played a significant role in shaping the Council documents. Michael Davies confirms this in his book on the New Mass where he states that "six Protestant observers were invited to advise this Consilium. 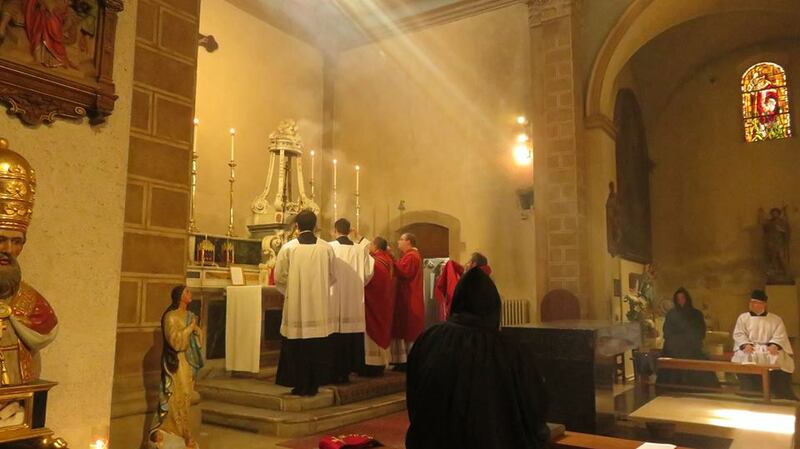 They played an active part in the preparation of the New Mass." Their names for the record were: Canon Jasper, Dr. McAfee Brown, Professor George Lindbeck, Professor Oscar Cullmann, Pastor Rodger Schutz, and Archdeacon Pawley. Cardinal Augustine Bea, who headed the Secretariat for the Promotion of Christian Unity, boasted of the contribution made by these Protestant delegates in formulating the Decree on Ecumenism, when he said: "I do not hesitate to assert that they have contributed in a decisive way to bringing about this result." Professor B. Mondin, of the Pontifical Propaganda College for the Missions, stated that delegates such as Dr. Cullmann made "a valid contribution" to drawing up the Council documents. This is not to mention people like Gregory Baum, the ex-priest and gay advocate who drafted the conciliar document Nostra Aetate for the Second Vatican Council, or Annibale Bugnini, the suspected Freemason who was the principal architect of Sacrosanctum Concilium, which laid out the design for the new Mass. Hence Vatican II in the final analysis was neither dogmatic, nor was it magisterial in the ordinary sense, but was a carefully contrived revolution to instigate departure from Church tradition, but in such a way that this is seen as the work of the Holy Spirit. This is why the Third Secret of Fatima urgently needs to be released, because only then will it shed light on what really happened at Vatican II and how it has caused the Church in our time to degenerate under the illusion of progress. Today Holy Mother Church calls to mind the life and heroic martyrdom of Sts. Tryphon, Respicius, and Nympha. These martyrs of the early centuries of Christianity are commemorated together because their relics are preserved in the same church at Rome. In about 1005, the monk Theodoric of Fleury wrote, on the basis of earlier written legends, an account of Tryphon in which Respicius appears as Tryphon's companion. The relics of both were preserved, together with those of a holy virgin named Nympha, at the Hospital of the Holy Ghost in Sassia. The church of this hospital was a cardinal's title, which, together with the relics of these saints, was transferred by Pope Pius V to the Church of St. Augustine in 1566. One tradition held that Nympha (Ninfa) was a virgin martyr from Palermo who was put to death for the faith at the beginning of the fourth century. According to other versions of the legend, when the Goths invaded Sicily, she fled from Palermo to the Italian mainland and died in the sixth century at Savona. 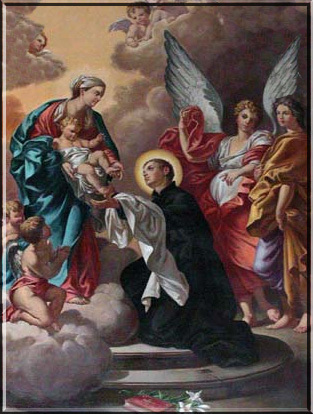 The feast of her translation is observed at Palermo on 19 August. Some believe that there were two saints of this name. Before 1624 Palermo had four patron saints, one for each of the four major parts of the city. They were Saint Agatha, Saint Christina, Saint Nympha, and Saint Olivia. Their images are displayed at the Quattro Canti, in the centre of Palermo. May we always be worthy to celebrate the feast of Your holy Martyrs, Tryphon, Respicius, and Nympha, O Lord, so that through their intercession we may be sheltered under Your gracious protection. Through Our Lord . 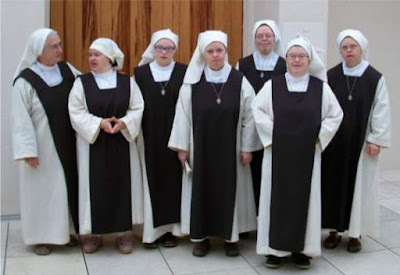 . .
Video of life inside an enclosed Carmelite community, including short excerpts of interviews with some of the Sisters. The Discalced Carmelites of Wolverhampton, UK, would like to thank Miranda Tasker and Marcus Nield, who made this film, for their hard work and professional skill. With only basic equipment, they did the filming and put together the presentation with sensitivity and understanding. Today in addition to commemorating the consecration of the Basilica we know as St. John Lateran, we commemorate the life of St. Theodore, known as St. Theodore of Amasea. This Roman soldier was cruelly tortured and burnt alive in the year 306 for having allegedly set fire to the temple of the pagan goddess Cybele. The source of our information on St. Theodore comes from St. Gregory of Nyssa who preached in honour of St Theodore in the late 4th century. 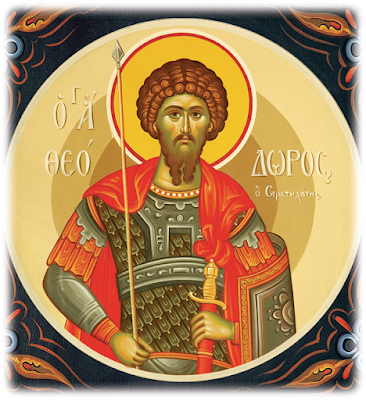 There is much confusion between him and St Theodore Stratelates of Heraclea. The glorious profession of faith of Your holy Martyr Theodore overshadows and protects us, O God. May we profit by his example and rejoice in the assistance of his prayers. Through Our Lord . . . The Sequence (Sequentia)—or, more accurately as will be seen further on, the Prose (Prosa)—is the liturgical hymn of the Mass, in which it occurs on festivals between the Gradual and the Gospel, while the hymn, properly so called, belongs to the Breviary. The Sequence differs also in structure and melody from the hymn; for whilst all the strophes of a hymn are always constructed according to the same metre and rhythm and are sung to the same melody as the first strophe, it is the peculiarity of the Sequence, due to its origin, that (at least in those of the first epoch) each strophe or pair of strophes is constructed on a different plan. A sequence usually begins with an independent introductory sentence or an Alleluia (an intonation with its own melody); then follow several pairs of strophes, each pair with its own melody; in the earlier periods the conclusion is uniformly an independent sentence of shorter or longer form. 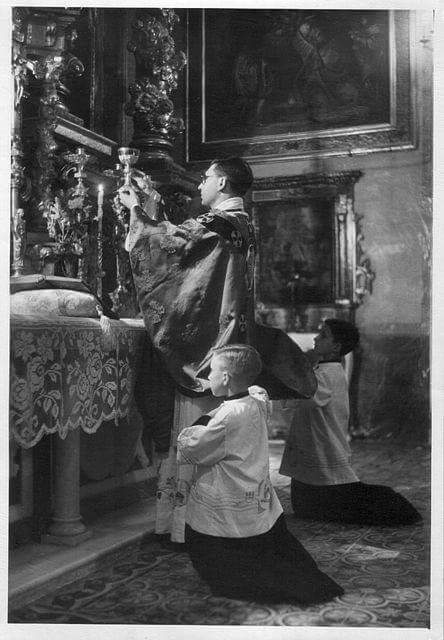 The sequence which is used in the Traditional Mass is used only on five occasions in the 1962 Missal though it used to be commonplace before the reforms of St. Pius V. The Book Catholic Music through the Ages: Balancing the Needs of a Worshipping Church states that Sequences were so plentiful before the reforms of St. Pius V that nearly every Mass had its own sequence. Fr. Michael Wurtz's July 2011 article on Sequences concurs when he writes, "From the 9th century when sequences first began to appear and later in the 12th century when they grew in complexity, hundreds of these hybrid Alleluia verses-hymns were composed and used in the Mass." And commenting on the work of St. Pius V's reform, Michael Davies further writes, "[he] expelled the host of long sequences that crowded the Mass continually, but kept what are undoubtedly the five best"
Nearly 150 years after St. Pius V's changes, the 13th century Stabat Mater for Our Lady of Sorrows was added to this list, bringing the total to the number five. These are the same five which survive in the 1962 Missal that is used today in the Traditional Mass. Also of note however, certain religious orders retain their own Rite of Mass and the possibility of using other sequences. For instance, the Christmas sequence "Laetabundus," not present in the Roman Missal, is found in the Dominican Missal. This sequence is permitted for the Third Mass of Christmas, the Epiphany, and Candlemas. Quiz your Catholic friends and see how many of them can name all five!